My go-to granola recipe is such a favorite, it takes a pretty terrific option for me to stray from my old standby! But as fall rolls around and I find myself basking in the glow of one of my favorite seasonal fruits, I find myself making several batches of this delightful pumpkin version. I have adjusted the recipe to include what I think is the ideal combination of nuts, seeds, and other add-ins. While I adore the addition of coconut, I hesitated to include “coconut” in the recipe name. For every person who adores coconut, there is one who steers clear. And while this ingredient may absolutely be omitted from the recipe, I do find it adds a certain something special to the final outcome. There is a short list of other options in this recipe, as different add-ins appeal to different people. My favorite part of this granola is how the slightly tart dried cranberries complement the mildly sweet and just-a-tiny-bit salty granola. To bolster the granola into a heartier snack mix, I often toss in a handful of lightly salted cashews and some sweetened coconut. My kids would also note that a sprinkle of white chocolate chips–or dark chocolate, for that matter–is an outstanding addition to the mix. And I would have to agree! 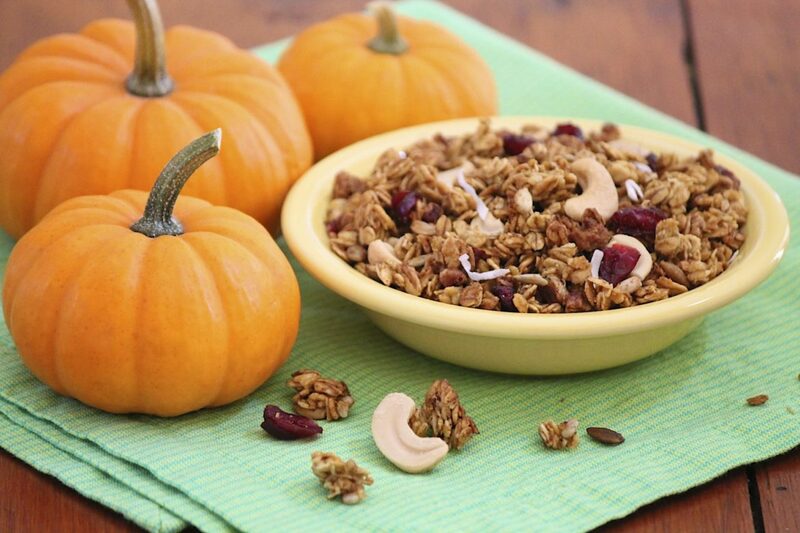 In this recipe, pumpkin works as a tasty replacement to a portion of the sugar and oil that lend crunch and sweetness to typical granola recipes. Preheat the oven to 325 degrees F. Line two baking sheets with sides with parchment paper, or lightly grease the baking sheets. If using a dark-coated baking sheet, lower the oven temperature by 25 degrees to prevent over-browning. In a large bowl, combine the oats, seeds, nuts (if including), shredded coconut, pumpkin pie spice, cinnamon, salt, and brown sugar. In another bowl, combine the pumpkin, maple syrup, oil, and vanilla. Pour the wet mixture into the dry mixture, and toss until the oats are thoroughly coated. Bake for 20 minutes. Remove the granola and stir. 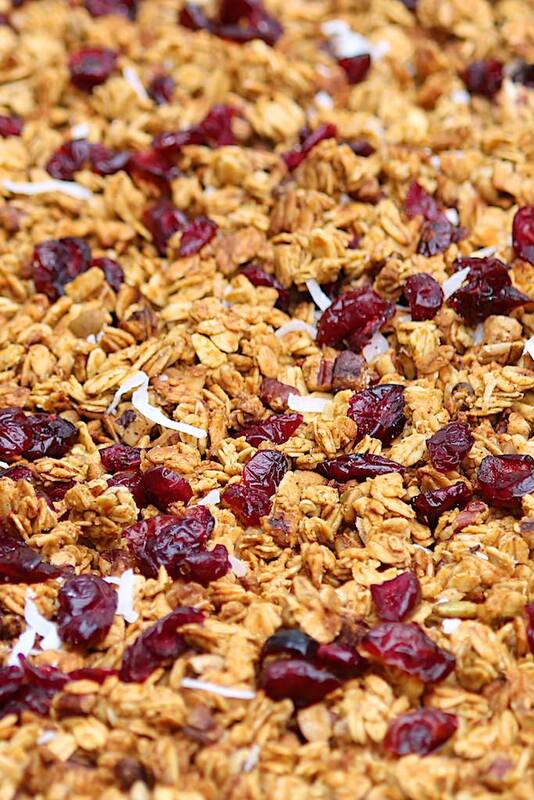 Bake in 10 minute increments or until the granola is mostly dry and crisp. (I typically bake for a total of 40 minutes; see notes.) 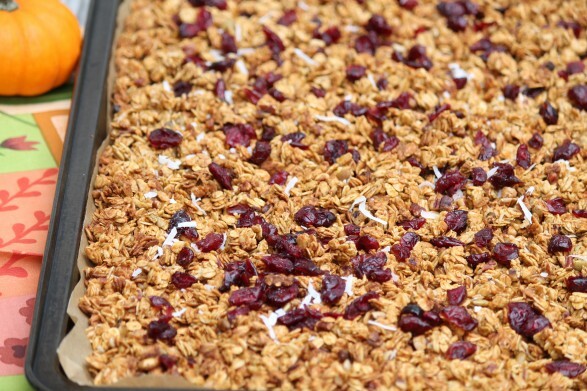 Remove the granola from the oven and allow to cool. Mix in the cranberries and any additional nuts or add-ins, and store in an airtight container. Sealed tightly, the granola will stay fresh for several weeks on the counter and for a month or two in the refrigerator. I like to add the nuts before baking so that they, too, are covered in the delicious flavors of this granola. Pecans, however, tend to burn more easily than the seeds and almonds. When choosing pecans, you may prefer to stir them in with the dried cranberries after baking. If you do cook them along with the granola, simply turn down the oven temperature 25 degrees if they are sufficiently brown before the granola is finished cooking. This looks out of this world Ann!! Thanks so much, Lauren! This is definitely a fall favorite in our house!! Made this yesterday and had it for breakfast this morning! It is delicious!!!!! I didn’t have coconut on hand so I made it without. I thought the pumpkin and spices made it absolutely scrumptious! Served on top of Greek yogurt, it was a power breakfast!